The Lazy Environmentalist shows you how to green your habits on a budget without overhauling your lifestyle. July 8, 2009, 2:13 p.m.
Can going green be cheap, easy, and good for the planet? 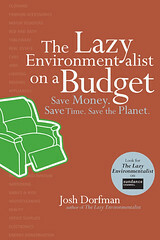 Yes, according to Josh Dorfman, who’s written a new book — The Lazy Environmentalist on a Budget: Save Money. Save Time. Save the Planet — to prove it. No, money-conscious environmentalism isn’t just about conserving and cutting back on everything — though of course, reducing and reusing are an important part of living green. Josh — who’s also a columnist at MNN — shows in The LE on a Budget that thinking green has gotten quite a bit easier in recent years, thanks to all the new green options out there offered by new eco-conscious businesses as well as older, bigger companies that are starting to cater to the green market. Gone are the days when finding organic cotton jeans or low-VOC paints meant an all-day hunt — on the web. Now, you can pick up eco-goods even at megastores like Target, Wal-Mart, and Home Depot. The LE on a Budget offers practical tips for all aspects of green living — whether conserving water and energy or raising kids and pets — along with the cold hard dollar details that’ll help you achieve those goals. Want to know how much a waterwise, wirelessly-controlled sprinkler system will cost you? Josh names the price (Cyber-Rain costs $349). Thinking drip irrigation instead? Josh estimates the cost for that too (typically as low as $40). Such specific details mean the book will likely get quickly outdated, as newer technologies and brands hit the green market. But the book’s a great resource to find out what specific, affordable appliances, energy-saving gadgets, and fuel-efficient cars are available now or coming out next year. More than anything else, The LE on a Budget serves as an excellent e-directory. I discovered quite a few eco-resources I’m now eager to try out, like Denim Therapy, an enterprise that’ll patch up my favorite pair of jeans at the fraction of a cost of buying a new pair, or Dyscern, a website where I can buy refurbished gadgets on the cheap. While rich on dollar details, however, The LE on a Budget is low on discussion of the more difficult questions that surround green consumer products. Josh highlights the reduced packaging of the laundry detergent Dropps, without pointing out that unlike most detergent packaging, Dropps’ packaging cannot be recycled in most communities. He writes Burt’s Bees products have “nothing to hide,” when enviro-activists have long called on Burt’s Bees to disclose the hidden ingredients lumped together under “fragrance” on its ingredient list. And while the book’s press release boasts that you’ll find out how to get “bargain basement deals on stylish organic bedding and bamboo furnishings at the largest retailers in the world” — the book doesn’t point out that such deals often come at the expense of lower labor standards and homogenized, car-centric neighborhoods. In fact the exuberance with which The LE on a Budget big ups shopping Wal-Mart’s green goods could be off-putting to environmental and labor activists. Still, The LE on a Budget could mean a small green step forward for newbie environmentalists who are cash poor but eager to start thinking green. Hopefully the book can serve as a first step toward a greener lifestyle that moves people from browsing the green goods at Wal-Mart to thinking beyond the big box store.